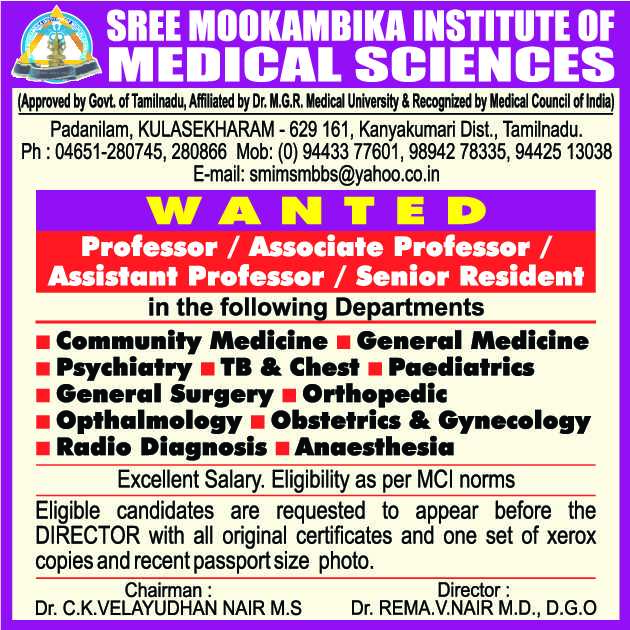 Sree Mookambika Institute of Medical Sciences, Kanyakumari has advertised in THE HINDU newspaper for recruitment of Professors / Associate Professors / Assistant Professors / Senior Resident jobs vacancies. Interested and eligible job aspirants are requested to walk-in immediately from 10th October 2018. Check out further more details below. How to Apply: Interested and Eligible candidates attend the Walk-in interview before the Director of the college by bringing their resume along with recent passport size photograph and all original certificates as well as one set xerox copies of certificates documents to the following walk-in address.